From the Spare the Air Youth website to educational tools such as the Clean Air Primer and Smog City, this section of the Spare the Air site provides entertaining and educational resources for teachers and their students. Welcome to the educational resources section of the Spare the Air site. 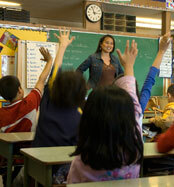 Education and awareness are key components in preserving air quality. On this portion of the website you will find links to entertaining and interactive resources for teachers, families, and students to help inform young people about air quality and the environment. Air District staff can also visit your school to speak about air pollution and engage students about what they can do to make a cleaner, healthier Bay Area. For more information, or to arrange for a speaker, please call (415) 749-4900. Visit the Spare the Air Youth website to learn about a regional program that aims to educate, inspire and empower youth and families in the San Francisco Bay Area to walk, bicycle, carpool and take transit to school.